This article is about the musician. For the basketball player, see Marty Friedman (basketball). At the age of 14, after attending a KISS concert, Friedman took up the guitar,and is largely self-taught. He rushed to form a band and started playing original songs, the reason being that originals are easier to play than covers. "Because," he says, "even if you screw up, you just claim that the song is written like that and no one can challenge you." The mother of one of Marty's friends ran an event center with a two-level stage, and Marty and his friends used it as a rehearsal space. Soon word spread about their band, and, since they were in a rural area, people would come from miles around to socialize and listen to music. "Rehearsals" very quickly became live shows. Friedman formed and played lead guitar in several other bands, including Deuce, Hawaii (which had previously been called Vixen), and notably Cacophony. Cacophony featured neoclassical metal elements and synchronized twin guitar harmonies and counterpoints shared with guitarist Jason Becker. He played guitar on the 1987 album It Won't Be Long by Christian rock band Shout. In 1988, he recorded demos for Jet Red that eventually were released as bonus tracks on the 2009 Jet Red release "Flight Plan". In August 1988, he released his first solo album, Dragon's Kiss. When Cacophony disbanded in 1989, Friedman auditioned for the thrash metal band Megadeth after a tip from his friend Bob Nalbandian, Friedman officially joined Megadeth in February 1990. Friedman's audition can be seen on the Megadeth DVD Arsenal of Megadeth. The first album he recorded with them was Rust in Peace which was released on September 24, 1990. Rust in Peace was certified platinum by the RIAA in 1994 and was nominated for the Best Metal Performance Grammy at the 33rd Grammy Awards. Friedman further developed his style of playing exotic scale solos from the Cacophony era, and integrated it into the music of Megadeth. In July 1992, Megadeth released Countdown to Extinction, which was a more commercial album, aimed at a wider audience, and sold double platinum. Friedman played on Megadeth's further releases Youthanasia (1994), Cryptic Writings (1997), and Risk (1999). After a total of five studio albums with Megadeth, in December 1999 Friedman announced his departure from Megadeth. His last show with them was on January 14, 2000. Friedman later stated that he got tired of "holding the flag" for traditional metal and felt that he could not evolve as a musician. In an interview with Ultimate-Guitar.com in March 2007, Friedman claimed that he wanted Megadeth to move towards a more aggressive sound and that he'd rather have been playing straight pop music than the pop-influenced metal Megadeth was playing at the time. During Friedman's time in the band, they sold over ten million albums worldwide. During his time in Megadeth, Friedman released three solo albums between 1992 and 1996, which featured Megadeth bandmate Nick Menza on drums. In 2009, Friedman collaborated with Ema Gelotte and Tinna Karlsdotter from "All Ends" as the lead guitarist for the song "With Me" which was featured in the game, Sonic and the Black Knight. In 2010, Friedman launched a record label under Avex Group, called Gokukara Records. In February 2010, during C.J. Ramone's Japan tour, he made a guest appearance on guitar for "California Sun", a cover song previously released by The Ramones on their 1977 album, Leave Home. In 2011, Friedman collaborated with Japanese idol group Momoiro Clover Z, providing guitar for their song "Mōretsu Uchū Kōkyōkyoku Dai 7 Gakushō "Mugen no Ai"", which would become a hit in 2012. In 2011, Friedman also worked with Ayanocozey Show to make the song SAMURAI STRONG STYLE, theme of the Tokusatsu movie Kamen Rider × Kamen Rider Fourze & OOO: Movie War Mega Max The catchphrase for the movie is "In Winter 2011, Movie War Will Evolve" (2011年冬、MOVIE大戦が〈進化〉する, Nisenjūichinen Fuyu, Mūbī Taisen ga Shinka Suru). Friedman and Ayanocozey had previously worked together when they joined the Japanese promotional super-group FANTA, releasing the 2010 single "Fantastic Love". Friedman stood for the "F" in FANTA, Ayanocozey stood for the first "A", and the other members of the group made up the other letters. Friedman recorded with Daniel Tompkins of Tesseract in Tompkins' band Skyharbor's debut album, Blinding White Noise. At the end of 2012, a full album containing heavy metal covers of Momoiro Clover Z's songs was also released by a band named "Metal Clone X". Although band members remained anonymous, Friedman was cited as label producer and arranger. In 2013, Friedman released his first library of guitar loops on LoopArtists. Friedman recorded collections of clean-tone, high gain lead and rhythm guitar loops that are intended for use in a production and remix environment. Friedman has been doing concert tours for the Bravely Default original soundtrack in 2013 as well as the Budokan concert tours among others. In combination with these tours he has also released his new album Inferno in 2014 which he is now touring across Europe going to places such as Norway, Poland, Netherlands and Germany. In 2014 Friedman collaborated again with Momoiro Clover Z, providing the guitar track for their single "Moon Pride". The song was also used as the opening theme music for the television series Sailor Moon Crystal, which premiered in July that year. In 2018 he collaborated with MAN WITH A MISSION's Jean-Ken Johnny, KenKen, and Kōji Fujimoto for the song "The Perfect World" which was used as main theme for Netflix Original anime series "B: The Beginning". Marty Friedman appears on Japanese television and is also a contributing columnist to Japanese music magazines and national newspapers. Speaking Japanese, he became a regular member of the cast of TXN's musical TV program Hebimeta-san (ヘビメタさん) (anglicized as "Mr. Heavy-Metal") with Japanese idol Yoko Kumada until the show came to an end in 2005. Friedman had his own heavy metal TV program called Rock Fujiyama alongside Shelly, Ken Ayugai (Kenny Guy), Yorimasa Hisatake (Rock Ninja Yorimasa) and ex-Scanch member Rolly Teranishi from April 2006 until March 2007. In November~December 2005 he toured with singer Ami Suzuki on her "Suzuki Ami Around the World" live house tour, which took place in Tokyo, Osaka and Nagoya. Friedman was featured on Jukebox, a television program in which Marty and two Japanese people translate the lyrics of various English songs into understandable Japanese. He has also made guest appearances on the television programs Eigo de Shabera Night and Tamori Club. In 2008 Friedman played the role of Paul Weinberg, an English language teacher, in Isshin Inudou's Gou-Gou Datte Neko de Aru. Friedman was a guest star in the Adult Swim original Metalocalypse by playing driving teacher Mr. Gojira. In 2009, Friedman appeared on The Quiz Show, a Japanese TV drama starring Sho Sakurai as a guest professor. On January 4, 2014, Friedman took part in New Japan Pro Wrestling's Wrestle Kingdom 8 in Tokyo Dome event, playing Hiroshi Tanahashi to the arena. 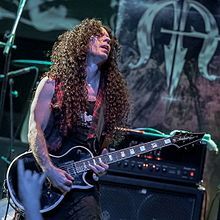 Marty Friedman is of Jewish heritage. He lives in the Shinjuku neighborhood of Tokyo, Japan. Shortly after the 2011 Tōhoku earthquake and tsunami, Friedman began auctioning off a great variety of his musical equipment and paraphernalia that he used as a member of Megadeth and Cacophony, including some of the earliest productions of Jackson Kelly guitars and his signature Carvin V220. In December 2012, Friedman married Japanese cellist Hiyori Okuda in Yokohama, Japan. Friedman is known for his improvisation and for fusing Eastern musical with Western music and other styles, such as neoclassical, thrash metal and later progressive rock. When playing, he often uses arpeggiated chords and various customized scales and arpeggios, some of which relate to Asian (Chinese and Japanese), Middle Eastern and other exotic scales, which are different from the typical minor/major pentatonic and seven modes based on the Major scale. He also occasionally uses sweep picking, as displayed in his famous solo on Megadeth's "Tornado of Souls". As a right-handed guitarist, Friedman has an unorthodox picking technique; the angle in which his hand is clenched goes against the conventional palm mute frequently used by right-handed players in Metal music. He also frequently utilizes upstrokes as opposed to downstrokes, especially on the B and high E strings. Rather than strictly picking from his elbow or wrist, Friedman will also pick moving his fingers—a technique known as "circle picking". 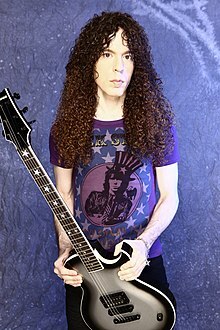 ^ "How Megadeth's Marty Friedman Became a Japanese Superstar"
^ "Marty Friedman's Imaginary Idol Kouhaku uta gassen part 4 "BiS and BABYMETAL's extreme battle!" • BABYMETAL FAN CLUB". BABYMETAL FAN CLUB. 1 February 2015. Retrieved 23 February 2017. ^ "Marty Friedman official website". Martyfriedman.com. Retrieved 2012-03-08. ^ "SweetJam". YouTube. Retrieved February 3, 2012. ^ "No Life 'til Metal – CD Gallery – Shout". Nolifetilmetal.com. Retrieved 2012-03-08. ^ a b Megadeth.com, Megadeth.com – History at Megadeth.com Archived January 1, 2011, at the Wayback Machine; last accessed December 29, 2007. ^ a b c "RIAA Gold and Platinum Database Search". Recording Industry Association of America. Archived from the original on June 26, 2007. Retrieved 2009-10-14. ^ Morse, Steve (January 11, 1991). "Grammys focus on fresh faces, jilt Madonna" (fee required). The Boston Globe. The New York Times Company. Retrieved 2010-11-28. ^ "Marty Freidman Interview: 2003". Rom. Retrieved 2012-08-04. ^ Ultimate-Guitar.com, Marty Friedman: 'I Didn't Think Megadeth Were Aggressive Enough!' at ultimate-guitar.com Archived August 18, 2010, at the Wayback Machine; last accessed May 5, 2007. ^ Martyfriedman.com, Biography of Marty Friedman at Martyfriedman.com; last accessed May 5, 2007. ^ "MARTY FRIEDMAN Launches Record Label". BlabberMouth. Archived from the original on November 27, 2011. ^ "ももクロ「モーレツ宇宙海賊」主題歌で壮大スペースオペラ". Natalie. December 22, 2011. Retrieved 2012-12-09. ^ "ももクロ、新曲は新アニメ『モーレツ宇宙海賊』OP＆ED主題歌" (in Japanese). Oricon. December 22, 2011. Retrieved 2012-12-09. ^ "東映、12月10日から「仮面ライダー」公開". Archived from the original on October 31, 2011. Retrieved 2011-07-24. ^ "メガ盛りのMOVIE大戦、キター－－ッ！！『仮面ライダーフォーゼ＆オーズ MOVIE大戦』 OCNアニメ・特撮公式ブログ OCNアニメニュース". October 7, 2011. Archived from the original on November 8, 2011. Retrieved October 31, 2011. ^ "ももクロの名曲がメタル化！謎の集団「鉄色クローンX」登場" (in Japanese). Natalie. December 3, 2012. ^ "Marty Friedman Releases 'Exotic Guitar,' His First Guitar Loop Library". GuitarWorld. ^ "Marty so full of Mega pride from spine-chilling Israel performance". jewishtelegraph.com. ^ "Ex-Megadeath Guitarist is now a Japanophile". Tokyomango.com. September 5, 2008. Retrieved 2012-03-08. ^ Sakura, Hoshino (5 September 2014). "Big in Japan ! ! ! – Marty Friedman – ex Megadeth Guitarist ! ! !". The 'Spill. Retrieved 23 February 2017. ^ Reesman, Bryan (28 May 2014). "Marty Friedman's Inferno". GRAMMY.com. Retrieved 23 February 2017. ^ "MARTY FRIEDMAN Hates Being Called A 'Shredder'". Blabbermouth.net. Retrieved August 1, 2017. ^ "Godlyke Distributing". Retrieved 2012-12-01.